With another year coming to a close, another “Best of” event can be checked off as completed. 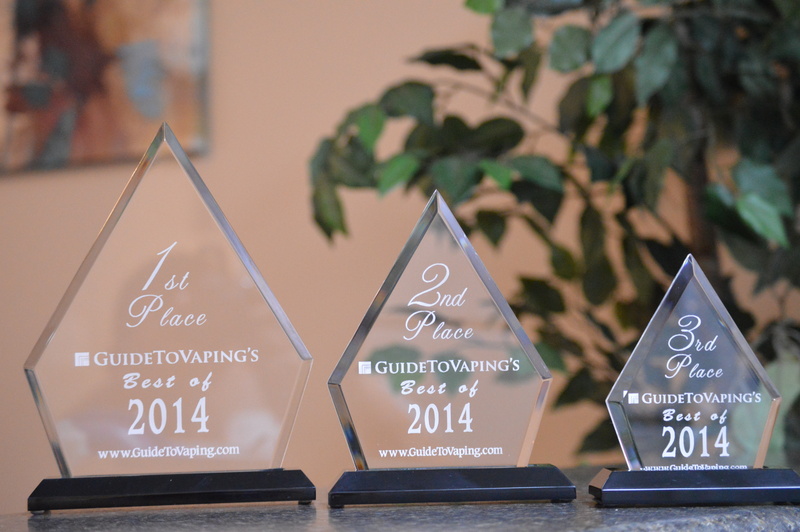 I would like to begin this post by saying thank you to all of you that participated in this year’s GuideToVaping’s Best of 2014. This year I had an upgraded server in place and hired a developer to create the poll you made your votes on in order to give you the best experience that I possibly could. There were many hiccups in the beginning that gave people trouble on voting, but once that issue was fixed, there was a flood of community members rolling in to make their vote. The amount of people who made a vote and how serious some people take this poll is mind-blowing, and I’m shocked to say the least. There is one issue that I would like to bring up with those of you who voted. The way we designed this poll is where you could choose to vote an answer that hasn’t already been voted for or you could pick through a list of answers that people have already voted for before you. Many of you didn’t look through that list, and we knew that you wouldn’t. This is why we made the poll where it would look through that list for you and alert you that there is a similar answer, then give you the option to change your vote to the provided answers, change it yourself or leave it how it is. Undoubtedly, many of you didn’t choose to change it to the similar answer because I had to go in and fix a lot of the mistakes for you. Some of the answers I didn’t even consolidate because there’s just that many answers within the list. I understand this is a problem and it will be fixed for next year’s Best of 2015 event. I would also like to apologize for anyone’s vote that I deleted. Some of you have very odd names, and there was a lot of votes made by trolls in an attempt to attack other members of our community. I combed through the list of answers on each category and would delete hashtags, such as #FUCKVAPORJOES and #FUCKJESSE. Little did I know, a YouTuber actually goes by the nickname “fuckjesse” with a hashtag, and this is something I was unaware of. Probably not the best name choice in my opinion. Anyhow, I was contacted by this Jesse user and was spammed because I deleted his name from the categories… it became such an annoyance that I had to block this user from contacting me on Facebook. I would like to publicly apologize to Jesse for deleting his name from the categories, but definitely do not appreciate the way he handled the matter. However, to give him some recognition, I’ll tell you to do what he told me to do… “Google me”. Yes, he’s that vape famous. Overall, I believe this year went much better than the year’s prior. I’ve learned about a lot of companies, products and people, so I believe GuideToVaping’s mission to “inform” was a complete success. If you’re wondering how the awards will work this year, I’ll explain that now. The winners for 1st, 2nd and 3rd place will be able to get a copy of this year’s award image, which they can display on their website. The 1st place winner will be able to use a gold award, 2nd can use the silver award, and the 3rd place winner will get a bronze award. To authenticate that you were a winner on GuideToVaping’s Best of 2014 polls, you can link the image to the results page, where they can see for themselves. As you all know, our Best of 2014 Category winners will receive an actual award that they can display at their shop or where ever they would like. Once the event has completed, those awards will be sent to the winners. You can see the awards at the top of this post. Thank you all for participating this year and congratulations to those who win! thanks very much for all your hard work!